Continue reading "Remodel, Drywall Repair and Finishing Of A Garage In Portland, Oregon"
Portland insulation and Portland drywall contractor Kemper Drywall, can assist you with both trades, saving you time and money. Continue reading "Excellent Insulation Work!" Continue reading "Painting My New House"
Portland Paint Contractor, Kemper Drywall, can assist you with your paint needs as well as your drywall and insulation. Multi Family Construction, requires a production based drywall contractor who can meet any schedule. Continue reading "Multi Family Construction"
Continue reading "New Sheetrock On My Remodel"
Continue reading "Old House Remodel"
Custom Home construction requires a top notch drywall contractor who can finish the project on time, within budget, and a quality finish. Drywall Remodel, are you looking for a remodel contractor to assist you with your project? Kemper Drywall has over 30 years of experience. Continue reading "NE Portland Restoration"
New Construction drywall contractor Kemper Drywall can assist you with any type of residential or commerical project. Continue reading "Quiet Rock (sound insulating) drywall"
Continue reading "Soundproofing Media Room"
Continue reading "Drywall Work In Duplex and Remodel"
Continue reading "plaster and lathe"
Continue reading "Patched a big hole in the wall"
Continue reading "Sun Room and Wine Room - Drywall Work"
Continue reading "Dry Wall Lower Level"
Acoustic Ceiling contractor, Kemper Drywall, can assist you with any type of ceiling tile install. Metal Framing contractor, Kemper Drywall, can assist you with any type of steel stud application. Insulation and drywall contractor Kemper Drywall, can assist you with both trades, saving you time and money. 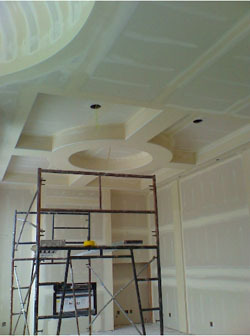 Do you need Drywall Services for your project in Oregon or Washington? Kemper Drywall can handle any type of job that you have. Official Website of Kemper Drywall, a Portland and Vancouver drywall contractor. Continue reading "Portland Drywall Contractor | Kemper Drywall"
Continue reading "Kemper Drywall Blog"
Residential Drywall Contractor, Kemper Drywall is a drywall company that specializes in all types of drywall contsruction. Continue reading "Residential Drywall Contractor"
Commercial Drywall Contractor, Kemper Drywall is based in Oregon and manages many commercial projects in the Portland area. Continue reading "Commercial Drywall Contractor"